The Happy Plant likely gets its name because it's a plant that's easy to care for and grows tall as it displays deep green leaves, making it the perfect center piece or background plant for your indoor garden. It survives, bounces back and flourishes in spite of its surroundings. The Happy Plant is also known as the Corn Plant. The Happy Plant resembles a corn plant. 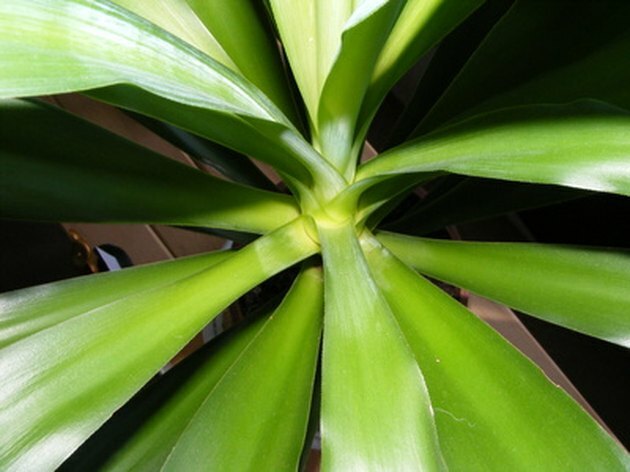 The biological name for the Happy Plant is Dracaena massangeana, and it's also known as the Corn Plant. This plant is native to South America and is shipped to various nurseries throughout America in the form of thick canes. The canes are put into containers of organic soil and peat moss where they root and then sprout out anywhere from two to several shoots known as tap heads from the top of the cane. Over time the heads grow taller, each bearing several stems of new deep green blade leaves that have yellow stripes down the center, and each being from 18 to 36 inches long. The appearance is like that of a corn plant and they can grow from 5 to 15 feet tall with a spread of 2 to 3 feet. They produce one or two long stems of fragrant white flowers in the spring. Happy Plants prefer rich organic soil. Happy Plants prefer shade to direct sunlight. The Happy Plant grows best in diffused sunlight or partial shade and prefers to be away from the heat of the sun. 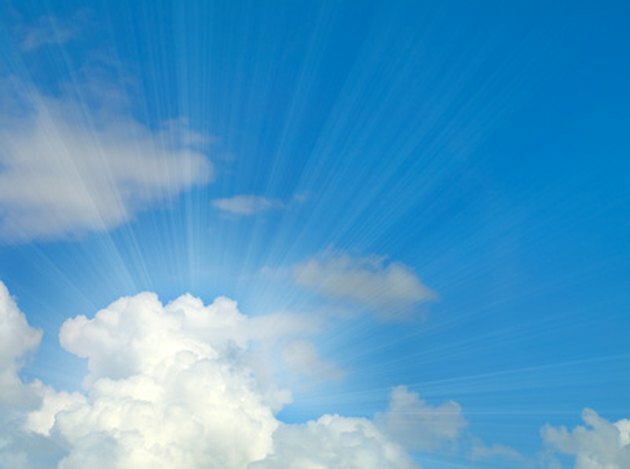 Direct sunlight will burn the leaves and cause them to dry out. Unlike many other flowering plants, the Happy Plant will produce flowers without direct sun and in cooler room temperatures. Happy Plants should be planted in a large pot with good drainage, and should be allowed to dry out before they are given water. 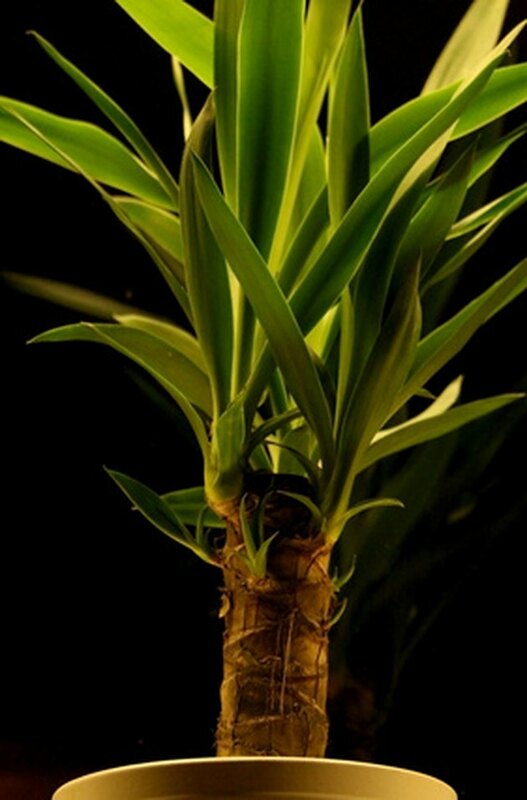 Too much water will cause root rot and the plant will die. You can spray the leaves with a warm water mist if the room is too dry. The best water is filtered water because there are no added minerals or fluoride in it which is harmful to these plants. They can be pruned any time of the year, and pruning is always done at the point where the tap heads grow out of the cane. When the plant is getting too tall or too thick, you can take a sharp tool and cut off the unwanted shoot at that point. Within weeks, another new tap head will begin to grow in its place. The unwanted shoots can be replanted into small pots of a mixture of rich organic soil and peat moss that has been thoroughly soaked. Trim back the excess leaves at the base of the shoot, keeping a stem of about 12 to 15 inches and two or three leaves at the top, and then stick it into the soil. You can put several shoots into one pot for a bushy plant or keep them separate. 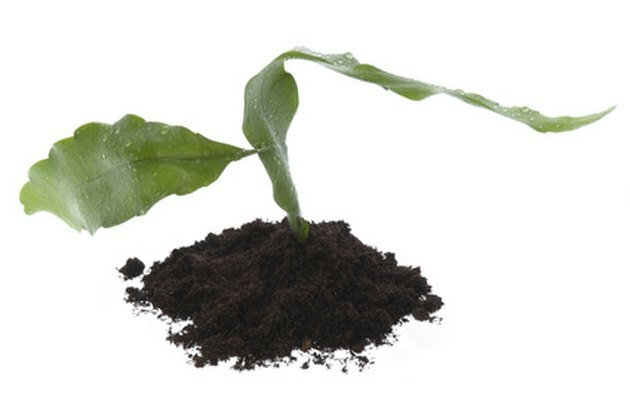 Keep the new plant out of the sun until it roots as the sun will dry up the plant and without roots the new shoot will not be able to drink and it will die. When you see new sprouts on the stem, you'll know that it has rooted and then you can move it into a brighter location if you prefer. Use a water soluble fertilizer and feed the plants every few weeks according to the instructions on the fertilizer package. Use fertilizers that are very low in phosphate which will be indicated by the middle number of the three main ingredient numbers on the label.